In my article keep it simple I listed a few of my basic rules for successful investing and said I would look at each one in a little more detail. I believe the selection of higher charging investment funds is probably the single most significant factor why the average private investor is not more successful. In his book “Monkey with a Pin” (free download from www.monkeywithapin.com) Pete Comley suggests the average investor could be missing out on up to 6% in returns on their investments. His research points to around 2% of this being attributed to charges. Fundsmith manager Terry Smith says the average UK investor who invests via an adviser, uses a platform and then invests in mutual funds, incurs total charges of about 3 per cent each year. Investment fund charges range between 1% and 2% - typically around 1.5% is the going rate for many. Traditionally, this figure has included a 0.5% trail commission which was paid to the platform or adviser however the introduction of RDR has banned commission on new sales (but can remain for existing arrangements). However, these charges which appear in all the literature and comparison tables are not the whole story. Although they are called ‘total expense ratio’ or now ‘ongoing charges’ - they do not include all the charges levied on the fund. For a start, they do not include transaction charges for the buying and selling of shares within the fund - nor do they include the 0.5% stamp duty on the purchases. The average ‘churn’ or portfolio turnover rate every year is around 50% - that means half of the shares held in the portfolio are likely to be traded in any given year. With some funds, the churn rate can be as high as 200% - which means the whole portfolio is turned over every 6 months. For every 10% of portfolio turnover, at least 0.2% is added in additional charges. This will typically add an extra 1% to the costs of holding the fund - more for less liquid markets like smaller companies and emerging markets funds. Another ‘hidden’ fee that will impact on returns is soft commissions - fund managers deliberately hide costs that should properly fall under ongoing charges by inflating commissions on transactions. If you hold funds, you may wish to contact you fund manager and ask if they pay for things like research from soft commissions - I would be happy to hear from anyone who receives a response. The effect of these ‘hidden extras’ will mean the average retail investor is paying not 1.5% in charges but more likely 3%. That’s 3% every year on the total value of your investments - whether they have performed well or not. You may have seen research that shows, over an extended period, most fund managers fail to consistently beat their benchmark. Research also shows that many small investors continue to waste money by paying active management fees for this consistent failure. 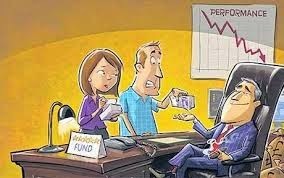 This underperformance is not just due to poor asset allocation or stock selection, though this is a factor, but just as much the drag effect of the high charges affecting the fund performance. A bit like the boxer going into the ring with one hand tied behind his back - he’ll land the odd lucky punch but 9 times out of 10 he’s going to be knocked out. As more people start to understand the drag effect of these higher charges on their investment performance, they are increasingly turning to low cost tracker funds. According to Investment Management Assn. figures, trackers accounted for just under 9% of the private investor market in 2012. Charges are typically around 0.5% or less - the Vanguard FTSE UK Equity Index for example has a TER of just 0.15% (plus 0.5% stamp duty). Portfolio turnover rate is much lower on trackers - typically around the 10% - 15% range so the charges for this should be in the region of an additional 0.2%. I will take a more detailed look at passive investing via trackers in a future article. Alternatively, Vanguard offer a FTSE 100 ETF (exchange traded fund) with a TER of 0.1% plus the added advantage of no direct stamp duty on ETFs (but it will be paid for indirectly on the investments within the fund). The difference between say 0.5% costs for a tracker and 3% total costs on a managed fund will have a huge impact on returns. Lets take the example of a person with a £10,000 lump sum and investing £100 per month over 20 years - a total investment of £34,000. Assume a return of 6% p.a. With the managed fund, after 20 years the investment would be worth £50,828 and with the low cost tracker £72,255 (comparison via Candid Money). I am an income investor and have used ITs for many years. A big reason for choosing trusts over funds was the typical lower charges - around 0.5% less - due to the fact they did not pay commission to intermediaries. With the introduction of RDR, the charges should narrow. TER can be as low as 0.4% on some trusts eg City of London and Bankers, but as with funds, there will be additional costs associated with transaction charges - portfolio turnover rate or ’churn’ is usually lower with trusts - typically 20% to 30% on average. I have not come across soft commissions with investment trusts - that’s not to say it does not happen! My best guess would be total charges between 1% and 1.5% - better than funds but not as good as low cost trackers. Whether fund managers can provide investors with added value for these extra charges is a huge subject for another day. Potentially the cheapest way to invest for the long term buy-and-hold investor. The average cost on purchase via a low cost broker will be around £10 but can be as low as £1.50 via a regular investment option offered by some brokers - plus the usual 0.5% stamp duty. That’s it - no recurring annual fund/trust fees. For the long term buy-and-hold investor, this can be a very cost effective alternative. However you will need to hold a diverse range of shares - at least 15 or 20 - to be adequately diversified so the initial purchase costs and stamp duty will be a factor. So, beware of charges when selecting your investments and invest for the long term - in the next instalment covering my basics of investing I will look at the importance of reinvesting dividends. Finally, who said "A low-cost index tracker is going to beat a majority of the amateur-managed money or professionally managed money" ? …answers on a postcard, or in the comments box below! One of my long held investment trusts, Murray International (MYI) has today reported results for the full year to 31 December 2012. Once again the net asset total return of 14% has beaten the benchmark of 11.4% - as an income investor, I am pleased to see a proposed 9.5% increase in the dividend from 37p to 40.5p. The current yield is just over 3.5% based on a share price of 1150p. Dividends have now almost doubled from the 21p paid in 2007 during 5 years of the toughest trading conditions on record. Total net assets for the trust increased 19% and take it to over £1 billion for the first time. Expenses, including performance fee, are just under 1% of NAV - the performance fees comprise 0.32% or around 1/3rd of the total expenses, which I think is acceptable given the record. What I don’t like is performance fees being levied for average returns. Manager, Bruce Stout has done an excellent job since taking over the reins in 2004. The trust has become the most consistent global equity trust under his stewardship and has outperformed its benchmark in each of the past 11 years. According to figures from the Association of Investment Companies, £1,000 invested over the past 10 years would have produced a total return of £5,700. Dividend growth over the past 5 years is 11.5% p.a. The review by Stout is well worth reading for his take on Western politicians and policy makers! MYI has been one of the cornerstones of my income portfolio for several years and I am happy to continue for many more years based on performance so far. The first rule of investing for me (and I’m sure many others) is timeframe - the longer you have to invest, the better chances you have of riding out the long term cycles and ups and downs of the markets. If you may need your spare money for other purposes in the next 5 years - deposit on a house purchase, holidays, new kitchen etc. then investing on the markets, however tempting, is probably best avoided. Put your spare cash in a savings deposit account. If you are thinking longer term - minimum 5+ years and preferably 10+ years - your investments will have a much better chance of providing better returns than your average cash deposit savings account. 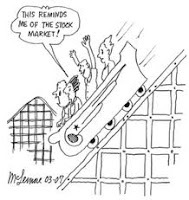 Of course, at any given moment in time you can always make out the case for not investing - in the 1990s there was the global recession, the Asian financial crisis and the irrational exuberance culminating in the so called ‘dot com’ crash of 2000. In the past decade we have witnessed the terrorist attack on the World Trade Centre, the military conflicts in Iraq and Afghanistan, hurricane Katrina, the credit crunch and sub-prime mortgage crisis, the European sovereign debt crisis and the problems with Greece, Spain, Ireland and Portugal. In the past week concerns have been expressed about the UK economy and we have lost our AAA credit rating with Moody‘s. Throughout this seeming economic and political turmoil, stable well-run companies have survived and even thrived, dividends have continued to be paid - with a few notable exceptions - and the markets, although a little more volatile at times, have continued their upward trajectory. It seems no matter what the crisis, and no matter how low the markets fall, they always bounce back - sometimes quite dramatically as we have seen with the FTSE in the past couple of months. I will cover the important area of asset allocation - what mix of equities, bonds, commodities, cash etc. - in a future post. For now, lets assume you are investing in equities (stocks and shares). 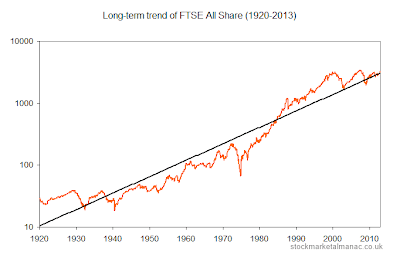 Numerous academic studies over the years have shown that over the long term, investment in shares will provide a superior return to both cash and bonds. The very long term (since 1900) average for shares, after inflation, is just over 5% per year compared to under 2% for bonds and just over 1% for cash. Equities have been the best place to invest in 6 out of the past 7 decades, however for the last decade 2000 - 2010, equities were beaten by both cash and bonds. I won’t go into more detail here but for those interested, look up Credit Suisse Annual Yearbook and also Barcap Equity Gilt Study. So, on average, you will get say 3% - 4% more every year investing in equities than you would get on cash deposits. How does this translate in returns over, say 20 years? As an example, lets take a lump sum of £10,000 and drip feed £100 per month over the 20 years - a total investment of £34,000. I have assumed an average rate of 3% on a cash deposit and 6.5% on equity investments. Using the useful calculator tools on Candid Money the return on the cash deposit would be £50,828 and the return on the investment would be £77,636 (after allowing for 0.5% investment charges). 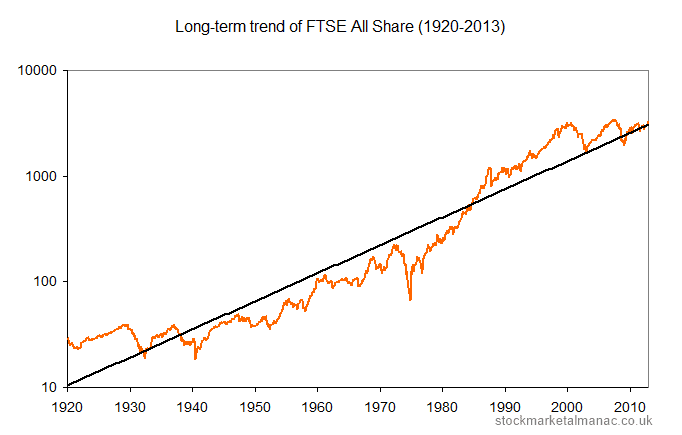 Be aware that these figures are based on long term averages - over shorter periods, equities may not produce the goods as we have seen for 2000 - 2010. The FTSE 100 has only recently returned to the levels last seen before the credit crunch in 2008 and has still to reach the dizzy heights of just under 6,930 reached in December 1999 (I know I should have sold those dot.com shares!). “The stock market is designed to transfer money from the active to the patient”. 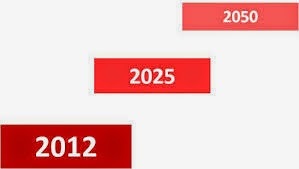 Of course, investing for the long term over many years will only be a part of the solution - you could be the epitome of the patient long term investor - a Zen master in the art of the long wait, but if you are in the wrong type of investment and you are paying high charges, your returns will be adversely affected. I will take a look at the importance of costs and charges in the next instalment. Although I invest mainly for income, from time to time I come across interesting smaller companies like Dialight which I bought into for my sipp around 3 years ago. Increasingly, the main focus of the company is Signals/Illumination which addresses the increasing demands for energy efficient lighting solutions through the use of high brightness LEDs (light emitting diodes) and utilisation of a number of associated technologies. Areas of business include Traffic and Rail Signals, Obstruction Lights and Solid State Lighting products. The LEDs' 90% energy efficiency over conventional lighting means the cost is recuperated in two years or less, on an industrial light guaranteed to last at least five years. They have today announced 2012 full year results which appear to have been well received as the share price has risen around 2%. Revenues increased 12% to £115m, and profits increased from £15.5m to £19.7m - the board are confident to propose a 35% increase in dividend from 10p to 13.5p and have more than doubled the 6.6p paid in 2009. At 1185p, the shares will yield just over 1% - definitely a 'jam tomorrow' share for income seekers. The lighting segment of the business is growing very quickly - this year, sales increased from £26m to over £45m and contribution to profits increased from £2m last year to £8.6m in 2012. "Since early 2009, when Dialight's first industrial light was introduced, the strategy has been to focus on sizeable niche markets with defensible barriers to entry. These deliver strong returns for customers through the application of the most current LED technology. Our focus has been to provide products which address the heavy industrial market and in particular those applications which demand the use of lighting which is rated for use in hazardous locations. The value that Dialight's products bring to this market applies as well to the installed base of industrial lighting as it does to brand new installations giving an addressable market size in the tens of billions of pounds globally. Our sales of £45.5m are tiny in relation to the available market and, bearing in mind that Dialight is the pioneer of LED lighting for industrial applications, the opportunity for superior growth exists for years to come." This is a top 5 holding for fund manager, Mark Slater who runs MFM Slater Growth Fund (ranked top performing fund over 3 years out of 300 funds in 2012). I like simple - plain, no frills wholesome food, a daily walk through the local woods, a pint or two at the local pub on quiz night. 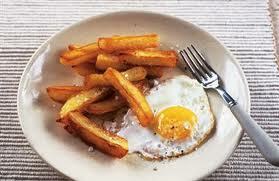 I take the same approach to my finances - nothing too complicated - a sort of egg & chips approach to investing. In my early career, I worked in the legal profession as a conveyancing executive. I dealt with mortgages, leases and property transactions. The language used in many of the documents was archaic and included such things as fee simple, easements and restrictive covenants. Of course, the legal profession has a vested interest in continuing to use these terms - language which can only be understood by the so called ‘experts’. The layman or woman will find it very difficult to feel confident dealing with such ‘complex’ issues. I believe it is a similar story in the world of financial services. There are many millions of column inches written in the financial media to persuade people about this or that approach to successful investing. We have absolute returns - how to master alpha - this ratio - that out-performance etc. etc. One aspect of this jargon is to add layers of complexification (is this a word?) which can only be understood and unlocked by the financial professional. It is designed to confuse and intimidate the average person. In my experience, investing does not need to be complicated. A pension is a long term savings plan - an ISA is a tax wrapper to keep your savings and investments out of reach of the taxman. If you pay a lot in charges for your investments you won’t end up as well off in 20 years than if you paid lower charges. This is not rocket science. You need to know a few of the basics well - the other 95% of what you come across in the financial media may be of passing interest but is generally not really necessary to make a success of diy investing. To take the analogy of driving a car - you take a few lessons to learn the basics but you don’t need to understand how the internal combustion engine works to get from A to B. The more journeys you make, the more relaxed and confident you become in your ability to drive the car. “If anybody ever tells you anything about an aeroplane which is so bloody complicated you can’t understand it, take it from me - it’s all balls.” I think he too would have been an egg & chips investor. So what are these basics? 1. Investment should be all about the long term - preferably 10 or more years. Be patient - get rich slowly. 2. Understand that markets and share prices rise and fall - sometimes quite dramatically. If you focus on these ups and downs on a regular basis, investing will at times be quite an emotional rollercoaster ride. 3. Keeping costs to the absolute minimum is important if you are to achieve a decent return on investments. Beware of over-trading - long term buy & hold should be the aim. 4. Start early and invest regularly - reinvest dividends. Understand the effect of compound returns over many years. 5. Choose the right mix of assets such as equities, bonds and property which suits your temperament and which can withstand volatile markets and keep you in the game over the long term. These are some of the key elements of investing which will help most investors to get a better return. In the next few instalments, I will look at each of these basics in a little more detail. In the meantime, why not leave a message and say what investment approach works for you. You have no idea how much of a struggle and challenge it has been to get this far in creating a blog! I started out last weekend buying a domain name www.d-i-yinvestor.co.uk from domainmonster. The first challenge was to get it to "point" in the right direction and that was to the company I had chosen to host my blog - 5quidhost. Well, after numerous emails, looking up the meaning of such things as nameservers, glue records, IPS Tags and a plethora of less memorable techie things, I finally managed this (I think!). I played around with things for a few hours until my brain started to hurt - I had managed to get the title heading "D-I-Y INVESTOR" to appear at the top of my page and gave it a nice blue colour - thats about as far as I could get. After another couple of days trying various options and getting nowhere fast, I decided perhaps I should upgrade to the latest version of IE. When I tried this, I was told my current XP version of Windows does not allow the latest version of IE and I would need to upgrade to a later version of Windows. At this point I was starting to lose the will to live!! I got back to domainmonster and asked for a refund but no joy. OK, plan B - try Blogger and forget about the fancy look and design - after all, I like simple. So here we are, my first blog. I have a feeling I need to find the "About" section and write a little bit about myself - a sort of introduction - but that will have to wait for another day.